"The final assessment characterizes the chemical as carcinogenic to humans..."
Slide Products believes this is the beginning of an inevitable phase-out of trichloroethylene from our industry, and molders and mold makers need to re-evaluate the products they use in manufacturing. You need to start the process to find safer, effective alternatives to the mold releases, mold cleaners, rust preventives, lubricants and other products you use. Call Slide Products. 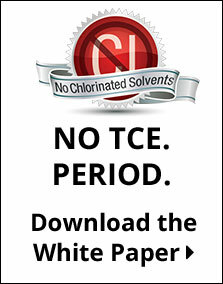 Slide has no trichloroethylene in any of its products. In fact, Slide has no chlorinated solvents of any kind. Slide is offering a free service to help you review processing aids and provide, free of charge, effective, and likely lower cost, alternatives for you to test in all your molding applications. Take the next step towards a safer work environment. Fill out the information below and we'll quickly contact you to answer questions, offer trial samples, and even come to your plant and perform a free audit. What items are you currently using that need to be replaced?